The 7MSN Ranch: An almost-zero-calorie, delicious, nutritious, snack food recipe...seriously! An almost-zero-calorie, delicious, nutritious, snack food recipe...seriously! I cannot keep this recipe to myself. It's so freakin' good and easy to make, it's bordering on obscene. I'm not kidding. We're talking Kale Chips – as crispy and addictive as potato chips, without the calories, without the fat, without the guilt, and with the added bonus of antioxidant properties. Whatever those are. I'm not a nutritionist, I just like to eat. I swear, until a month ago, I had never tasted kale in my life. It was not on Mom's grocery list (correct me if I'm wrong here, Mom) and certainly never on mine. But then came the wicked winter of 2010, and I found myself craving and making any soup recipe I could find. My kale obsession started when I made this Spicy Tuscan Soup. It called for kale, which I soon discovered 1) was available at the super Walmart and 2) was pretty darned tasty. Which led me to look for more recipes that contained kale. 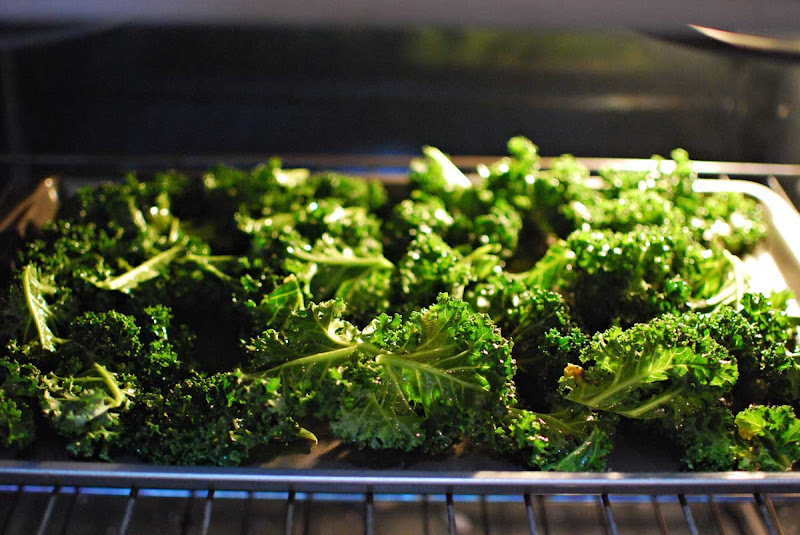 I found this recipe for Kale Chips, but got stuck when I didn't have an "olive oil spray bottle" in my gadget arsenal. But I did have some zero-calorie olive oil cooking spray in the cabinet, so I decided to experiment. Herewith is my spin on Kale Chips. So you buy yourself a bunch of kale. It's so beautiful, it should be called a bouquet of kale. Here is one gorgeous green stem. 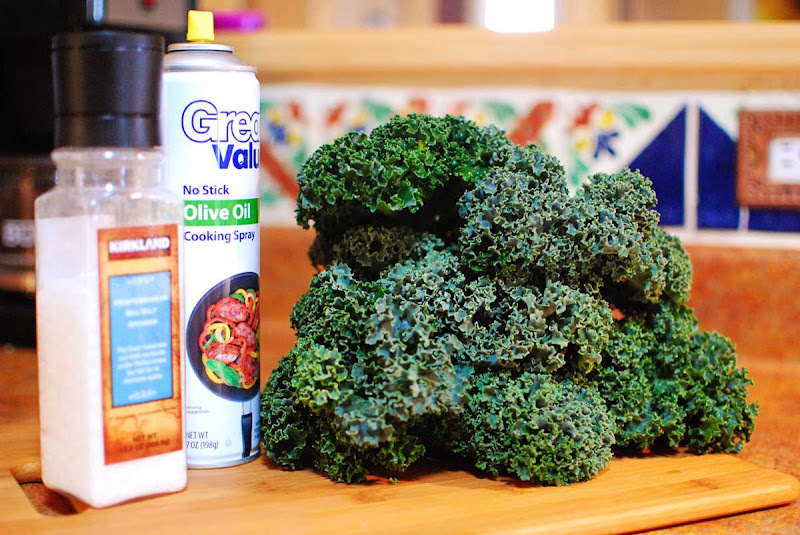 And here is the sum total of everything you'll need to make this recipe: kale, olive-oil flavored cooking spray, and salt. 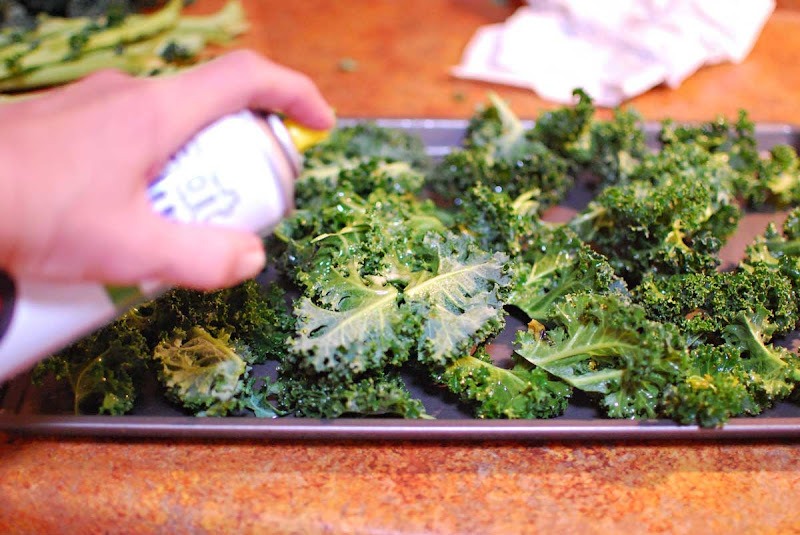 Trim the kale leaves off the stem and place them on a baking sheet. 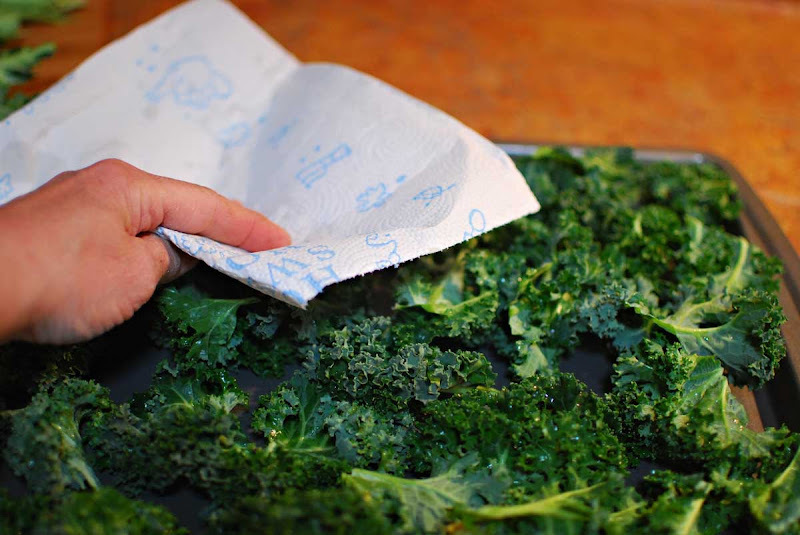 Blot off any moisture with a paper towel. Liberally spray the kale on both sides with the cooking spray. Bake for 15 minutes at 325 degrees, until it gets crispy but before it gets brown. Can it get any easier? I don't think so. 1. Kale has more nutritional value for fewer calories than almost any other food around. 2. Kale is in season from the middle of winter through the beginning of spring, when it has a sweeter taste and is more widely available. 4. Kale is unusually high in fiber, very high in beta carotene, vitamin K, vitamin C, lutein, zeaxanthin, and reasonably rich in calcium. 5. 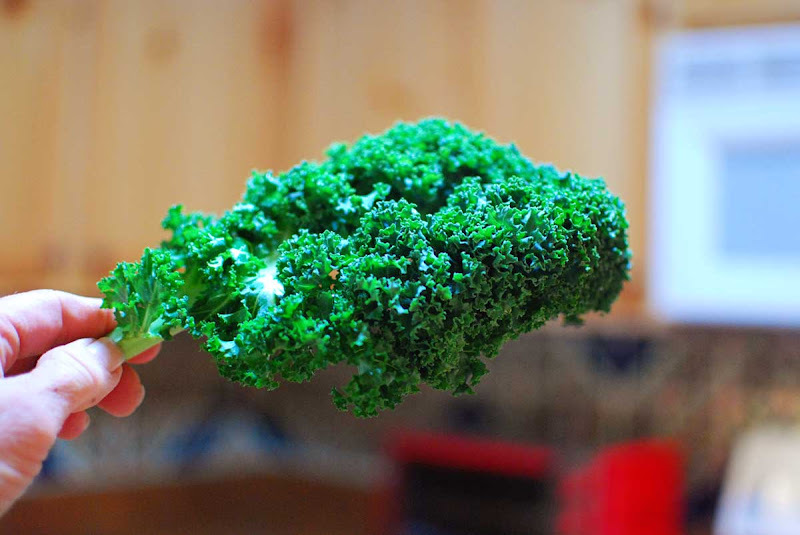 Kale contains sulforaphane, a chemical believed to have potent anti-cancer properties. Kale, where have you been all my life? And I am not alone in my new food obsession...witness 365DaysofKale.com. I've yet to find out if the boys prefer kale to carrots. Call me selfish. Now that sounds pretty interesting and I'm going to have to give it a try. I'd heard folks rave about it and all it's wonderful benefits, so years ago I grew kale, but obviously didn't know how to deal with it, so never tried it again. The Spicy Tuscan Soup sounds yummy! I never hear of kale until right now! Now I am on a mission to find me some and try this out! Oh, I LOVE Kale... love this recipe for chips. I'll do it today. How I cook Kale and I find it quite good. I chop up the Kale, stems and all into 1/2 inch pieces. 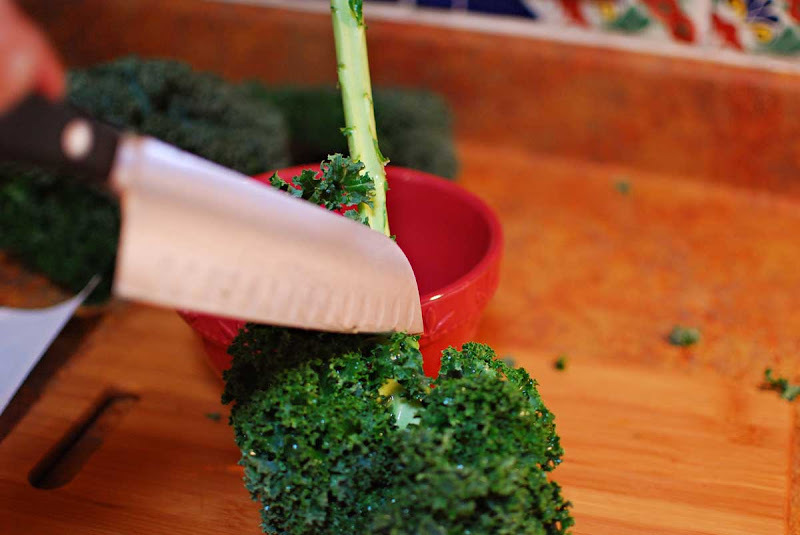 I chop across the stems and leaves and then I make a chop along the grain of the stem. Cut up about 4-6 cloves of garlic. It depends how much you like garlic. Put 2 tablespoons of olive oil in the bottom of a large sauce pan that will hold the chopped Kale. Heat the oil. When it shimmers, add the minced garlic. Stir around, don't let the garlic brown. Add the Kale. Stir around. Put a lid on the pan. Cook on medium heat - you don't want the kale to burn, you just want it to wilt. If you want to add a little zest - add about a teaspoon of fresh lemon juice and a teaspoon of fresh lemon zest. (I bought one of those pedi-egg things that I use just for zesting fruit rind. Lemon rind has a lot of good nutritional value. zesting the rind and adding it to dishes gives it a gourmet flavor. Thanks for the Kale chip recipe. We love kale too. 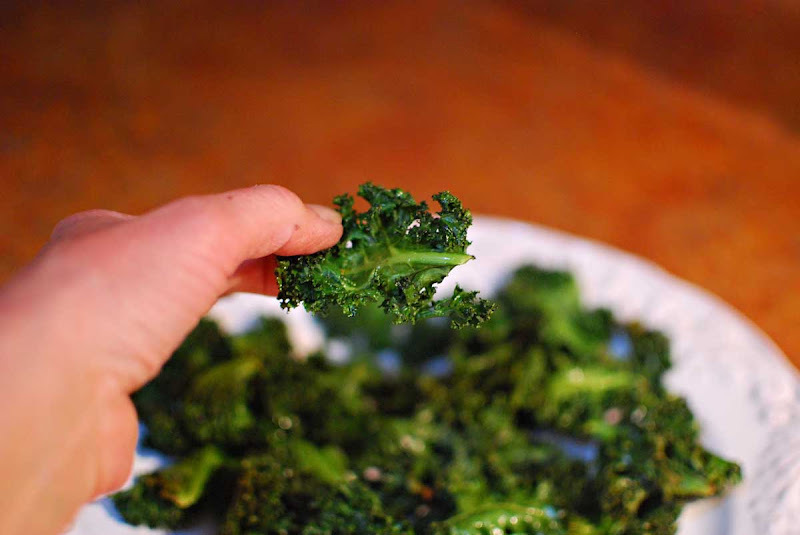 One of my favorite recipes is kale lightly sauteed with olive oil and toasted pine nuts. The crunchy kale is good too, prepared the way you've described. Yummo. What a healthy snack. That sounds pretty interesting. Since I'm always on a diet and on the lookout for no calorie snacks I might give it a try. My grandparents (from Germany) always had Kale around but I never tried it. It just didn't appeal to me when I was younger and saw it cooking in the pot all day with some nasty meat stuff. Love Kale! Love it in soups and stews and stirfrys and... Will have to try chips. Try it in a sausage and potato soup like the home made version of Olive Garden's. Awesome. I recently had spinach prepared in a similar way ... it too was delicious! I'm definitely going to try the kale chips...thanks! Have been trying to lose some weight and this receipe will help! Thanks! It stays that green and turns crunchy? Like chips? Serious? Oh I need to try this. How funny, I've been on a kale trip this past winter, too. I've made these "chips" a couple of times, and even the dogs love 'em. I just bought kale for the first time yesterday myself and I have been Googling ways to cook it, but now I think I am going to try your way first! Too funny & thanks so much! Hmmm. I'll have to give it a try. The only green we had in our house when I was growing up was iceberg lettuce and a sprig of parsley (when we had company over). I'm just wondering if adding smoked paprika might be a good idea. It gives a slight ham/bacon taste to foods. I'm going to have to try this. I'm a muncher, always looking for something tasty. Sounds interesting! Olive oil is good for you, especially if it is cold pressed, extra virgin, which allows it to retain all it's food value. I too use Himalayan salt; it's the only one that doesn't make you retain water. Thanks for the recipes. I am going to try the chips and the soup. My husband grows kale in our garden and I am always looking for new recipes to try. 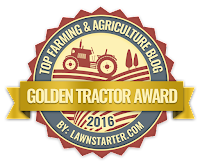 I will check out the kale blog too! Sounds uh ... healthy. But definitely worth a try. I'm always looking for ways to feed my kids something green besides green beans. On another note, my best friend's sister just named her newborn son Kale. These are the burning questions in my mind: Will the next one be named Romaine? Do they call the bunting the dressing? And are they using a salad spinner to dry him after a bath? Mature I know. I've always heard Kale is so good for you. Even grew it in my garden one year but didn't know what to do with it. Thanks for the recipe ideas! Hi Carson: Kale is wonderful. I cook in down in a some chicken broth. Add some garlic too if you like. Mix it in with warm mashed potatoes....it's just real good. Who ever knew kale could be so beautiful? And delish? And good for you? Thanks Carson! People up here in the Pacific Northwet, the Seattle area anyway use kale for, get this: landscaping! Nothing with flowers will grown throughout the winter, so folks here grab kale plants and stick them in their planters. Who woulda thought they could have been eating them, salty and crisp instead? I will try this one, if only for the shock value. It doesn't look like a potato chip, which means it must be better for you. I've never tried it, but I will. You've inspired me. I love crunchy foods and this sounds great. Thanks, Linda. Ummm...not quite buying it. You are gonna have to persuade me some more. VERY interesting! I'll be checking that out, to be sure! Great minds think alike, Bossy also has a post ready to go on Kale Chips. HAH! what does a Kale chip taste like? I heard "delicious", but what does it taste like? Help! I found this on today's (8/25/10) post. I never had Kale when I was growing up or in my adult life. We do use purple and light green Kale as gardening decoration in the winter. I pulled up the soup recipe on Tasty Kitchen and saw your comments! It took me almost three years to get up my nerve, but I just baked up a batch. So yummy! I have a kale plant growing in a big pot outside. This is the fourth year that it has come back, getting bigger and bigger each time. I don't eat a lot of kale, so there is enough for me and for the chickens. I just keep clipping off the leaves and it keeps on growing, though it dies back for part of the winter. So, free kale chips! Going to make a batch right now. Thanks again for this recipe.